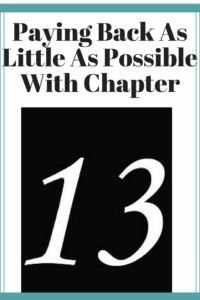 When someone is looking to file chapter 13 bankruptcy, they obviously want to pay back as little as possible. They also want to gain the greatest amount of relief during the process. There are a number of factors that go into determining whether or not the monthly payment is going to be high, low, or somewhat in between. It is basically based on assets, liabilities, monthly income and monthly expenses. In a recent case, a client who filed five previous chapter 13 bankruptcy cases is seeking to have her chapter 13 plan payment lower than originally filed. Let’s examine the facts of the case. As I mentioned previously, the debtor had filed five previous chapter 13 bankruptcy cases. Neither case had gone through to completion. However, the prior cases did last for various periods of time. None of the cases was fraudulent in any way. The debtor had significant financial issues which led to extreme hardship. For these reasons, the debtor was required to file and to file quickly. In one of the prior filings, the debtor had to file to save her job with the city of Chicago. In her current case, she is being forced to pay back 100% of her unsecured deb t over a 60 month period. This is due in part to the fact that real estate with equity was sold in between her prior case and her current case. I have gone over her debts in painstaking detail to determine whether or not we can lower the amount she pays per month. What we have found is that even by removing some creditors which the debtor claims she does not owe, the amount of the plan payment will not reduce significantly. When you’re talking about a $1500 creditor, a $900 creditor and a $600 creditor, that total amount divided by 60 is rather insignificant. For these reasons, the debtor is going to have to make this case work at the higher payment amount than hoped. In addition to this fact, the debtor is also under a permissive filing. The law firm was able to garner an order imposing the automatic stay on all creditors in the current case. However, the order also stated that if the current case is dismissed for any reason, then the debtor will be barred from refiling for one year from dismissal under any chapter of the bankruptcy code. Thus, if the debtor fails in the current case, she will not be able to be file a chapter 13 or even a chapter 7 bankruptcy case within one year from the date of dismissal. For these reasons, it is imperative that the debtor follow through with this chapter 13 bankruptcy case to completion. Otherwise, she is in jeopardy of losing her job, having her wages garnished, having her bank account attached, and having other creditors take legal action against her since there will be no bankruptcy protection for at least one year from the date of dismissal. So as I mentioned earlier, debtors like to pay back as little as possible under a chapter 13 bankruptcy case. As the attorney for the debtor, I do my best to make that happen. However, there are some cases and some circumstances where I simply cannot lower the plan payment any more than what the computer software demands that it be. That is what we have in this particular case. I hope that the debtor will understand this fact and will make budgetary adjustments which will assist her in the completion of this chapter 13 bankruptcy.